Halcyon Theme Develop a great restaurant website with the Halcyon theme. Benefit from integration with an online food ordering system and start making money online. Benefit from the Halcyon restaurant website template The Halcyon restaurant website template from UpMenu will help you build your brand’s image. A simple CMS will support you when developing your website, while making it possible to introduce changes at any time. Let your customers find you online thanks to this UpMenu restaurant website theme. A design to match your restaurant When choosing one of the best restaurant website templates you can be sure that a given theme can be easily adjusted to match the image of your restaurant. 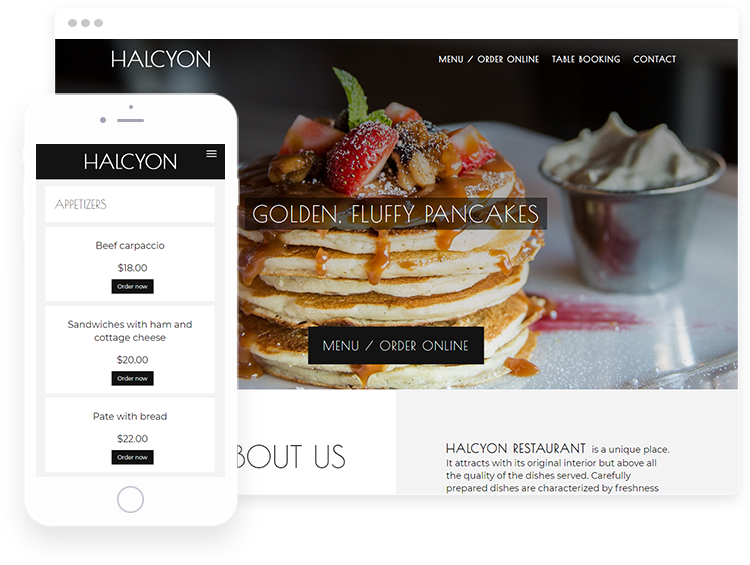 Develop a restaurant website with the Halcyon theme. Show your restaurant online and increase your profits. Add photos and present your cuisine at its best The best restaurant website themes must show outstanding cuisine. Halcyon provides the possibility to make a great photo presentation. Show customers what’s best at your restaurant. Choose a restaurant website template with CMS support for adding photos and simple content editing. Simple integration with an online food ordering system When you use UpMenu restaurant website templates, you can launch an online food ordering system quickly and easily. Increase the profits at your restaurant and limit the amount of commissions paid to a food portal by carrying out more deliveries thanks to an online food ordering system.